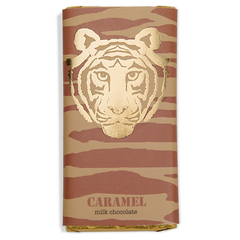 Cloaked in cool camo greens, the tiger in neon orange on our limited edition peppermint chocolate bar, shines brightly in our rain-forest of flavours. Under that deceivingly big bold, but just out of view wrapping, lurks a dark jungle of complex cocoa notes stealthily sliced through with clean, sharp peppermint. This bar has bite. With 53.8% cocoa solids, the highly refined dark chocolate is the moist forest floor of earthy and mossy footprints, whilst the clean bite of the natural mint essence is the fresh air of the evergreen canopy rustling in the wind. Made by local farmers and their families in sustainable Ecuadorian businesses.